Let’s face it; those of us who AREN’T Trump supporters are having to put up with a hella lot of chaos. We aren’t going to (emotionally) survive if we don’t get better at dealing with chaos. One of the most influential people of the last five years of my life has been Leo Babauta, creator of the awesome website Zen Habits. It is a wonderful thing to have order to our lives, to simplify and have routines and systems that make things peaceful, organized, and calm. Unfortunately, life likes to throw chaos and disorganization our way. Things get disrupted, people interrupt, email requests pour in, our neatness gets messy, schedules get thrown into disarray, things get busy and hectic and complicated. How can we stay sane in the middle of all this chaos? How can we take the chaos and busy-ness and messiness, and use them as opportunities to get good at handling it all? The answer is with practice. And the practice is a method of letting go and re-centering in the middle of chaos. When chaos and messiness come our way, it’s not necessarily a bad thing. It’s not inherently stressful and anxiety-inducing. It’s just that our minds don’t usually like these things. We want order and simplicity. So the problem isn’t the external situation. It’s our internal ideals. We want order and simplicity, not to be interrupted, not to be overwhelmed. The ideal of orderliness is causing our frustration, stress, anxiety, not other people, not a chaotic situation. The ideal of orderliness causes our difficulties. And we created the ideal. Therefore, we are causing our own difficulties. The good news is that, if we created the ideal, we have the power to change it. What if we let go of our ideal of orderliness, and created a new ideal: the perfect situation is what is in front of us. Our current experience is perfect, as messy and uncomfortable as it is. It is absolutely perfect. We just need to see its beauty. Notice that we are getting anxious or frustrated. Notice that our ideal of orderliness is causing the difficulty. Let go of that ideal, which is causing our pain and struggle. Breathe, and re-center ourselves, so that we become calm. This is simply returning to the present moment, with no ideals, seeing the situation afresh and with new eyes and an open heart. See the beauty and perfection in the moment in front of you. That’s the method, and it is simple. But not easy. The difficulty comes from a couple of things. First, we don’t like to let go of our ideals. We want things to be the way we want them. We want people to behave the way we think they should act. We want control over things. That we can’t actually have these things doesn’t often matter. We want them nonetheless. Second, we have difficulty in seeing the perfection in chaos and disorder. They don’t live up to our ideals, so seeing the beauty in them is foreign. We need to open up to them, but we’re not used to it. The answer to these problems comes with practice. Whenever you have difficulty with disorder and chaos, with letting go and seeing the perfection in the moment … this is an opportunity for practice. And what a wonderful opportunity it is. Feel the hardness in your heart when someone is behaving imperfectly. Feel the sharp edge in your chest when things start to fall apart and get messy. Feel the frustration in your torso when someone interrupts your quiet time, or leaves their things out and makes a mess. Then see that as a wonderful opportunity to practice. Notice when you’re resisting the method above. It could be because you don’t want to let go of your ideal (what you want) or because you don’t want to see the beauty in the current moment. It’s one of the two (and they’re the same thing). Sit (or stand) still. Pause and notice your resistance. Notice what’s going on. Try to open your heart and mind, just a little. Be less closed off, and more open to what’s happening. How can this be your teacher? How can you open up, just 1%, to what is in front of you? Little by little, you can learn to let go of your ideals (which are causing you difficulty) and open up to the perfection of the messiness of this moment. 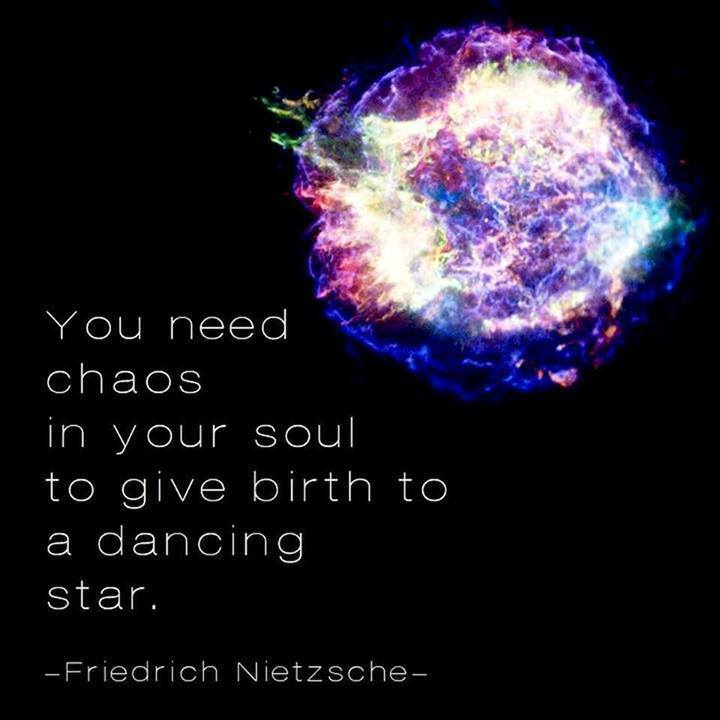 And as you do, you’ll get better at chaos. You’ll be the master of messiness. You’ll be the Zen center of the universe. What an amazing gift to give yourself. This entry was posted in Chaos and tagged Chaos on October 12, 2017 by Silver Willow. One of the bible quotes I remember, though I don't know the reference is, “Be still and know that I am God.” I always remember that amid the chaos. 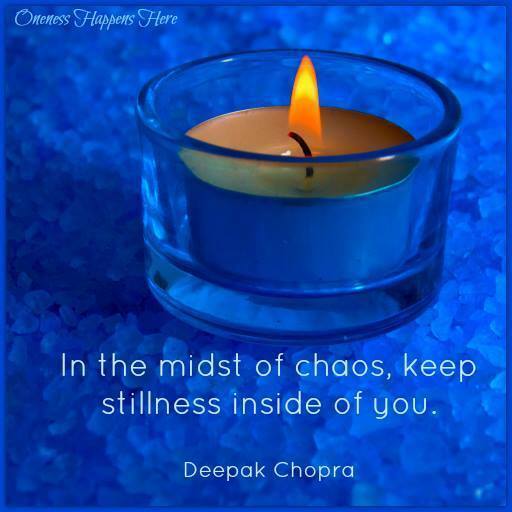 I don't believe that we can (or should) completely ignore or dismiss the chaos with Zen or mindfulness. At least for me, it's doing my part to sound the alarm and fight against the forces of evil that I see at work through Trump that calms in middle of the chaos. Doing some Zen practices to focus and gather and our power back is good, but using Zen to turn our backs on evil will only lead to more evil. Evil must be checked and balanced out by people who care. I guess I do need to find time to let go briefly of this chaos we are living in and regenerate. This week I went to the dentist for what I thought was a toothache. He said my tooth was fine but was I aware of grinding my teeth. “Only since January 20th,” I answered. He laughed and said he totally understood. I can totally relate! Sorry you are grinding your teeth. Must have a look at Leo Babauta's work. Maybe I need to just stop watching the news and getting upset. It just feels like our country is in chaos and it just keeps building. I guess I need to take this advice to heart. Thank you for posting this and sending me to another site that I think I will enjoy. This is important stuff! I visited an intuitive healer for problems with acid reflux and she said, “This is all about Trump for you.” It started right after the last November election so that made complete sense. We need to take care of ourselves and the light will grow from there. Yes, I developed ulcerative colitis for the first time in my life, due to Trump and his followers. Not good. I'm glad you like Leo and his work. He's been very helpful to me the past 1-2 years, especially.